Some namespaces are added by default when you add a new XAML control in your project (be it a UserControl or a Page). But, as stated before, when your project starts growing and you need to work with different namespaces and assemblies your references might start piling up and your XAML code gets bloated. These projects reflect how a real application could look like. All controls are organised in a separate namespace Controls (could even be an other assembly) and the same thing applies to the Converters. Then you could have an other assembly with more converters. Maybe this assembly contains some global converters that are used throughout all the projects in your company. But what are are options to clean up our XAML? Instead of adding "my" or any other word as prefix it added sdk. It would be nice if we can trigger this behavior when adding our controls. Instead of a clr-namespace + assembly reference it adds a regular (schema) url. Go to the project where you want to map CLR namespaces to a custom namespace. Add the XmlnsPrefix and XmlnsDefinition attributes. As you can see, we use the XmlnsDefinition attribute to map multiple CLR namespaces to a single custom namespace. The beauty of this is that you aren’t limited to a single assembly. In the downloadable source code you’ll see these definitions for both the application as for the class library. You could think of organising all your controls, converters, utils, … under a project wide namespace. Again, imagine 5 more assemblies, and 20 UserControls making use of all these assemblies. No bloating! If you’re referencing 1 or 500 assemblies, you’ll just be using this single custom namespace. Oh, and if you didn’t notice yet, the XmlnsPrefix declares the default prefix (for that namespace) that should be added automatically. When I added the Calendar we automatically got an sdk prefix, and now for my own controls I’ll automatically have the sw prefix. Now you don’t have to stop at Option 1. You could actually get rid of all your extra namespaces. As stated before you are not limited to a single assembly. Meaning more than one assembly can declare the same namespace. 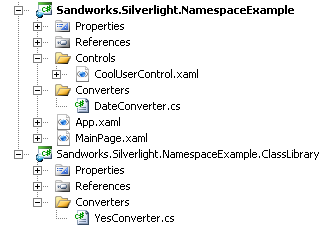 You do not need to add extra namespace references in your XAML controls. I myself prefer Option 1. Totally removing namespaces and prefixes could also become a problem in larger projects. The thing I tend to do is create 1 customnamespace for company wide assemblies and 1 custom namespace for project specific assemblies/projects. The source contains 2 scenarios. One with regular namespace usage and one with our custom namespaces.